Hurley Caps - Hurley Block Party Trucker Cap - Anthracite :: Men > Hats and Caps. 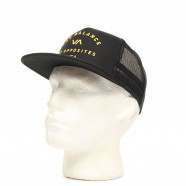 Men's trucker capSoft foam front with branding embroideryMesh panel to back for ventilationFlat peak with stitching detailSnapback fastening for adjustable fitStripe detail to sideMaterial: 65% Polyester. 35% Cotton Size: one size.